I took this photo in front of the entrance to the Fitters Arms. 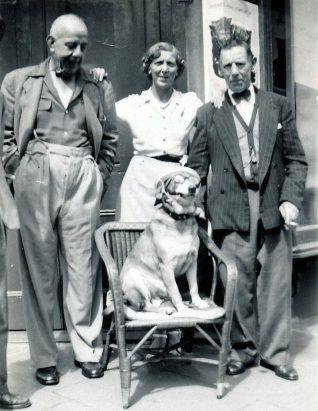 The chap on the right was the landlord Tom Eade with his wife, Eadie and left of the picture the landlord of the White Hart, Percy Searle. Sitting in the chair was Toby, Tom’s dog. Toby was a lovely dog, he liked nothing better than to sit in a chair wearing his hat and glasses with a pipe in his mouth. When Toby felt bored he would trot down to our pub, the White Hart and sit in one of our chairs. Actually Toby was an asset to us as he could do ‘tricks’. The best one being asking him to get various objects from the cellar, such as a bottle of light ale/brown ale/cider etc or even a mallet or spanner. Tom showed me how to set up this trick which I found useful in keeping customers inside the pub buying more drinks! Of course I always gave Toby a biscuit for his troubles. Tom also had a talking parrot in his bar. Unknown to his wife Eadie, Tom and the cellarman taught the parrot a few, rather naughty, words. Tom told me that one day Eadie was in the bar on her own when the brewery rep. called in. The rep. went over to the parrot cage, put his finger in the cage and said ‘pretty polly’ (as one might). The parrot told the rep. to ‘go away’ but in much fruitier language, Eadie was extremely embarrassed. Tom was at work at the time but he had to suffer the wrath of Eadie when he arrived home after work. Of course he was in denial re. the parrot’s English teacher….so would I have been…any man would, nothing like being a devout coward in such circumstances. Hi Barrie. 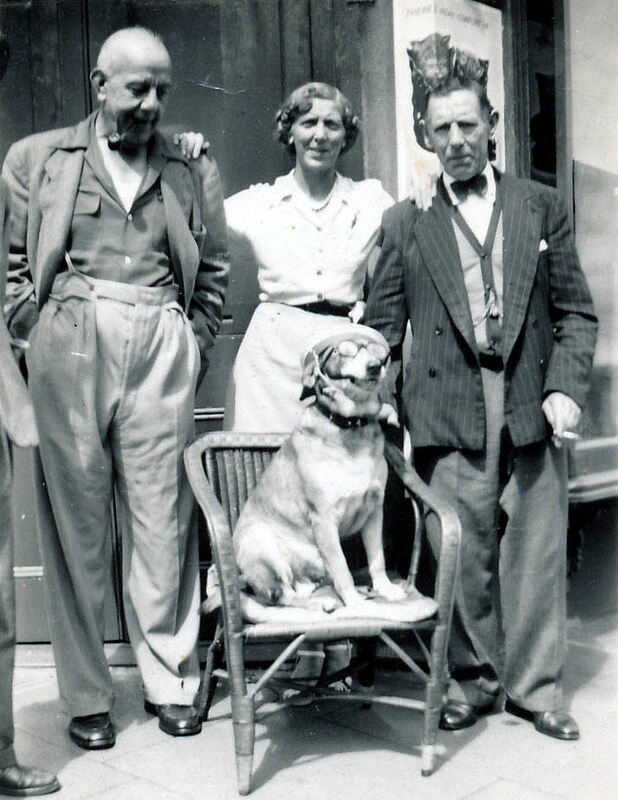 The photo you took of Tom and Eadie – they are my grandparents. My mum Jean was their only child. I have a photo of myself at about 3 years old with Toby, I think outside the pub. Have you got any other info or photos about my grandparents? Hi Barrie. I have been looking for a photo of the Fitters Arms which was run by my great grandfather Walter Chapman for 20+ years until his death in 1925. Can you help? Sorry Alexander, the photo above is the only one I have. Walter Chapman was also my great grandfather. I am also looking for other photos of this pub if they exist. Walter must have been my great, great grandfather, as one of his daughters, Louisa (Lulu), was my grandmother who married Joseph Cooper and they had Sheila and Douglas. Sheila is my mother who married Lewis Cain. Another one of his daughters, Susie, was my Aunt who married and had a son called Norman Fiest and they lived at 59 Upper Lewes Road. I remember going to stay with them and we used to have sing-song around the piano. Apparently my Aunt Sue used to dress up as a Pearly Queen and go visiting old people’s homes entertaining them with singing. Uncle Charlie was a bookmaker. I remember my Nanna, Lulu, speaking about the Fitters Arms. Hi, Alexander. Would be interesting to know who your grandfather and father were as you still have the Chapman surname. Hello, Walter. Please could you let me know your lineage and how you came to be a Robinson? For those of you looking for a photo of the Fitters Arms and if it was originally a Kemp Town Brewery pub then you can get one from the National Brewery Centre in Burton on Trent (01283 532880). Ask for the collections manager and quote reference C&Co 0659. Was your comment addressed to me Judith?